These lids can be delivered anywhere in the Contiguous United States. Your USA made Yellow Poplar lid is shipped from Virginia by UPS to arrive within four to eight business days from receiving your order. 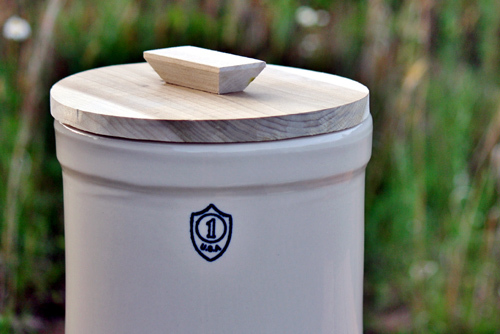 Exterior wooden lids are made to fit on top of Pickling Crocks made by Ohio Stoneware. These are handmade locally in our small town of Hillsville, Virginia. Constructed of unfinished solid Yellow Poplar wood sanded smooth to finish. These wooden lids are food safe and may be lightly sanded and stained as desired. A food grade stain or finishing oil should be used. These lids do not create an airtight seal. Wooden lids are made individually, therefore lids measurements may vary slightly. Learn more about the differences between fermentation crock shapes and styles available.